What is the Darlington Fund? The Darlington Fund is a tax-deductible way for alumni, parents, grandparents and friends to support the school. The Darlington Fund is responsible for providing the fiscal support it takes to maintain year-to-year excellence in educational technology and curriculum, faculty development, financial aid for students, and other needs. Tuition and endowment earnings provide just over 95% of Darlington’s operating budget. The rest must come from annual gifts. What is the Family of Funds? Donors now have the option of directing their gifts into one of four funds that supports the school. If you are passionate about faculty development, the Teaching and Learning Center, or providing financial aid for deserving students, you may now designate your gift into one of these “families.” If you make no designation, then your gift will go to Darlington’s area of greatest need, which may include costs related to curriculum development, technology enhancements, school operations and other essential programs. Darlington needs every member of the school community to make this institution a charitable giving priority through a gift to the Darlington Fund. A high rate of participation is an important measure of the breadth of concern and involvement by the school community. Decisions by foundations and corporations to support our school are positively influenced by strong, broad support. Depending on individual financial circumstances, contributions may vary from $5 to $10,000 or more. We ask that each constituent give as generously as possible within his or her means. Darlington needs and appreciates gifts of every size. What is The Darlington Fund goal, and how will we reach it? This year’s goal is $1.15 million. 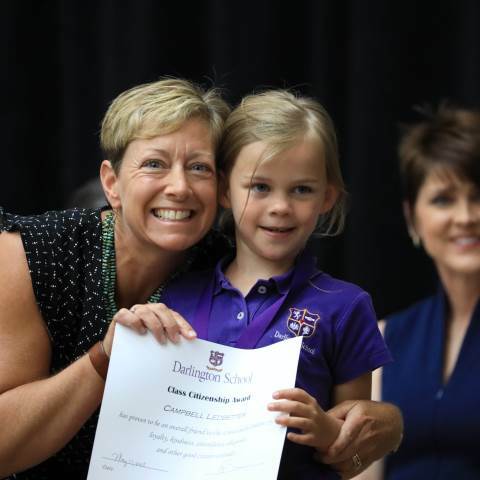 Darlington simply could not have grown into the school it is today without the patronage of the entire Darlington family. The future of Darlington will be equally dependent upon a broad base of support maintained through the Darlington Fund. The responsibility for maintaining and enhancing Darlington’s excellence rests squarely on the shoulders of every member of the community who is a beneficiary of its past or guardian of its future. Matching gifts are often available from employer’s matching gift programs. Please take the time to ask the Human Resources Office if your employer has one, or click here to check our list of companies that match gifts. What is a stock gift? Gifts of common stock can be donated at any time, allowing the donor to receive the fair market value of appreciated securities at the time the gift is made, while avoiding capital gains tax in the appreciated value of the stock. I would like to make a donation, but I cannot afford to write a check for the full amount all at once. What options do I have? Your gift does not have to be a one-time payment. You can make multiple payments by check, cash, credit card or transfer of stock. Paying securely by credit card online is an easy option by visiting our giving page. Multi-year pledges are also encouraged. Darlington’s current fiscal year runs from June 1 to May 31. Please contact Julia Douglas, director of The Darlington Fund, for further information. Darlington School is a 501(c)3 organization.